An original crochet amigurumi guinea pig pattern by June Gilbank. These baby piggies are so adorably tiny that they can sit in the palm of your hand - just like real baby guinea pigs! Test the waters by making your first simple colour changes for the Banded guinea pig. Get your feet wet with a few more colour changes for the Blazed markings. Wade into multiple changes per round with the more complex Dutch markings. 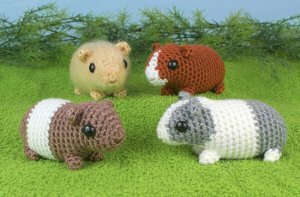 Date Added: 09/13/2018 by Kendra H.
I love making these little guinea pigs, and they are so much fun to customize! Date Added: 02/27/2018 by Peggy G.
This pattern is very easy and comes out sooooo cute! Excellent instructions as always. Date Added: 04/20/2017 by Jackie M.
Date Added: 03/20/2016 by Megan W.